Getting old is not for sissies. Although Pieter-Dirk Uys has most likely been called a sissy in his lifetime, and many other things by the politicians he has spent a career brilliantly satirising, his latest show proves, once again, he has a bellyfull of courage. He also has a full belly, as befits a healthy man of 73, which he neatly covers with a favourite black waistcoat as he presents his latest one-man show, When in Doubt Say Darling, amidst a jumble of crates (from Darling dairy of course) and Take-a-Lot cardboard boxes. Which is ironic because Pieter has given a lot and taken little during his 40-plus years of performance. He gave us a way to deal with our anger and fear as the vicious and brutal apartheid rulers crushed our country beneath their inhumane racism and narrow-minded conservatism. He did so by revealing their pettiness and stupidity, and holding them up to the ridicule they so deserved. In doing so he helped ease our fear and spurred us on the path of civil disobedience. The Nelson Mandela presidency saw him struggling for traction, because how do you ridicule Madiba. But then along came Thabo Mbeki and his Aids denialism, with Manto Tshabalala Msimang in tow. Pieter took to the stage on behalf of the hundreds of thousands of South Africans denied lifesaving anti-retroviral drugs and lambasted that short little man with his pipe, his Shakespeare, and his deadly disregard for science. And then, of course, came the trump card: Jacob Zuma. Pieter regales us with these career recollections in a show which is part autobiography, part self-reflection, and part nostalgia, bearing in mind South African nostalgia is about three parts bitter to one part sweet. For many, there is no nostalgia, only memory, and the fact the audience in the Fugard Studio theatre was 99% white despite 1994 having happened 24 years ago, is a reminder of that. But Pieter is well aware of our diverse experiences. Also, being both an Afrikaaner and a Jew, he knows how to make a little bit of sweet stretch a long way so that the medicine can go down. He does it so well that you only realise you’ve gulped it down after the fact. The bitter pill we gleefully digest here amidst the innocuous ruminations on growing old and downsizing and memories of renovating a crumbling Victorian house full of snakes when he perchance moved to Darling, is the hate speech and violent rhetoric of the EFF, as well as the dangerous shut down of public debate and freedom of expression by a new generation of self-righteous, hashtag-brandishing, censorious youth. The truth of which is weird, because usually it is the youth who break the calcified conservatism of the older generation, not the other way round. Pieter, for instance, has come under fire by the social media generation for impersonating a black man -– Zuma. Ingeniously, he gets around this in ‘Darling by impersonating PW Botha impersonating Zuma. But then, true to form, he defies his censorious critics by donning a doek and impersonating a coloured Muslim aunty from the Bo-Kaap. In between putting on a hat and tie here and a doek there and a fake leopard skin where-ever, he just chats to us. Or at least it feels like he chats to us — it’s easy to forget he’s a consummate actor — telling stories about people he’s met, things he’s done. He becomes most vulnerable when, without warning or preamble, morphs into a forgetful geezer packing up home for a two-roomed (bathroom and bedroom) downsize. For a little while it is unclear whether this is a new character or if Pieter is still acting as Pieter. Then it becomes clear: it is Pieter acting as an old geezer in the country acting as Pieter acting as an old geezer. It goes around to him, standing there amidst a jumble of boxes, lost in memories that fold in on themselves. If this is old age, he’s certainly no sissy. In fact, he’ll even give you a free lesson on how to put fake eyelashes on in the men’s toilets without poking your eye out. 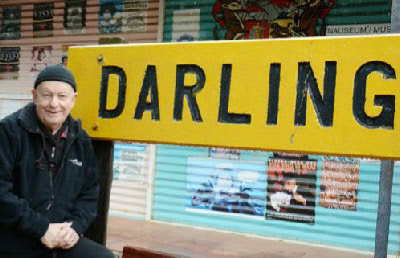 When in Doubt Say Darling is back at the Fugard Studio Theatre until 15 December.